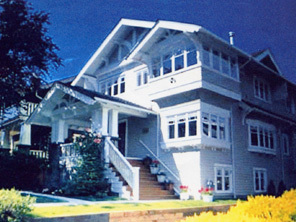 Collingwood Manor, West Point Grey, Vancouver, B.C. In the West Point Grey neighbourhood of Vancouver, B.C. ½ block from the ocean, a short walk from Kitsilano and Jericho beaches, not far from the Yacht club. To rejuvenate a grand old arts and crafts house for an heiress and her husband. The house was completely gutted. The top floor was transformed into a “New York loft” inspired space with a beautiful kitchen, living and dining area, capturing the sweeping views of English Bay, downtown Vancouver, and the mountains. The main floor has several bedrooms and the basement was made into a spacious two bedroom, completely independent, guest apartment.